The term “pressure-treated” refers to a chemical process used to make plywood more durable. Chemical preservatives are manually injected into the wood, which helps to make it less vulnerable to termite and insect damage, fungal damage, weather damage, etc. When and how did this process begin? In the early 1900’s, Karl Wolman discovered that infusing chemical preservatives into plywood could help protect against the various conditions listed above. Since then, pressure treating plywood has grown into a massive industry. First, the plywood is placed into a holding tank. This tank is then depressurized to remove all of the air in the tank. After the air is removed the chemical preservative is placed into the tank under high pressure. This forces the chemical deep into the wood. The pressure-treated wood is then removed and leftover chemicals can be reused to pressure-treat more wood. Until the early 2000’s, the preservative used was Chromated Copper Aresenate (CCA). However, this chemical is extremely toxic and can lead to damages in both the wood and health of individuals that come into contact with it. For this reason, the industry has moved to Amine Copper Quat (ACQ) and Copper Azole (CA) to pressure-treat wood. These chemically are much safer to use and cannot be absorbed into the human body as poison, unlike Aresenic-type chemicals (ex. CCA). 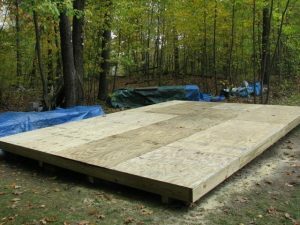 Where can pressure-treated plywood be used? Depending on the specific type, pressure-treated plywood can be used pretty much anywhere. To further explain, different chemicals work better for different environments. The same principle applies to the specific type of wood, meaning that certain types work better for different environments. What safety precautions should be taken with pressure-treated plywood? 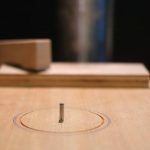 Even though modern advances in technology and health knowledge have helped to make this plywood much safer than it was in the past, safety precautions should still be taken. The following tips will cover general bases to help protect against any health concerns that may come up while working with chemically treated plywood. •	Wear gloves and wash hands thoroughly. •	Wear safety goggles to avoid eye contact. •	Always cut pressure-treated wood outdoors and in open spaces. •	Do not burn chemically treated wood. •	Be sure the wood is completely dry before painting or staining. •	Keep up with general wood maintenance, such as checking for cracks, sinking, etc.